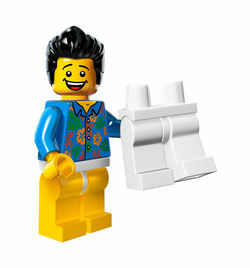 “Where are my Pants?” Guy is a minifigure that appears in 71004 The LEGO Movie Series and one of the characters in the 2014 film, The LEGO Movie. "Where are my Pants?" Guy has a thick, slicked black hairpiece. He has a yellow head with printing that depicts black eyes with white pupils, black eyebrows, and an open smile showing his white teeth and red tongue. He has yellow hands, blue arms, and a blue torso resembling a Hawaiian shirt; the torso shows part of his skin at the top and is decorated with buttons and pink, green, and orange tropical flowers. He holds a pair of white pants in his right hand, and his hips are white and legs are yellow, with the combination resembling underwear. “Where Are My Pants?” Guy stars in Where are my Pants?, the favourite TV show of Emmet and, for that matter, much of Bricksburg. The show, which serves as media approved by President Business and keeps citizens unimaginative and distracted, is filmed in the TV studio section of Lord Business' Office Tower. In the show, the "Where are my Pants?" Guy is the actor who plays a husband who can never seem to find his pants. A common trope in the show is the character asking his wife, "Honey, where are my pants? ", dragging out the last word as his head spins around, a trope that most Bricksburg citizens find hilarious. After the heroes escape the Think Tank, they interrupt the filming of the show and Benny uses the equipment to record and transmit a message of Wyldstyle encouraging the citizens of the universe to tap into the creativity that they all have and use their unique ideas to defend themselves from Lord Business. He has a same hair piece as the Mechanic and Frank Rock. He is the first minifigure in the Minifigures theme to come with two pairs of legs. The "Where are my Pants?" logo can be seen in the TV studio section of 70809 Lord Business' Evil Lair. Facts about ""Where are my Pants?" Guy"
This page was last edited on 16 January 2019, at 11:42.